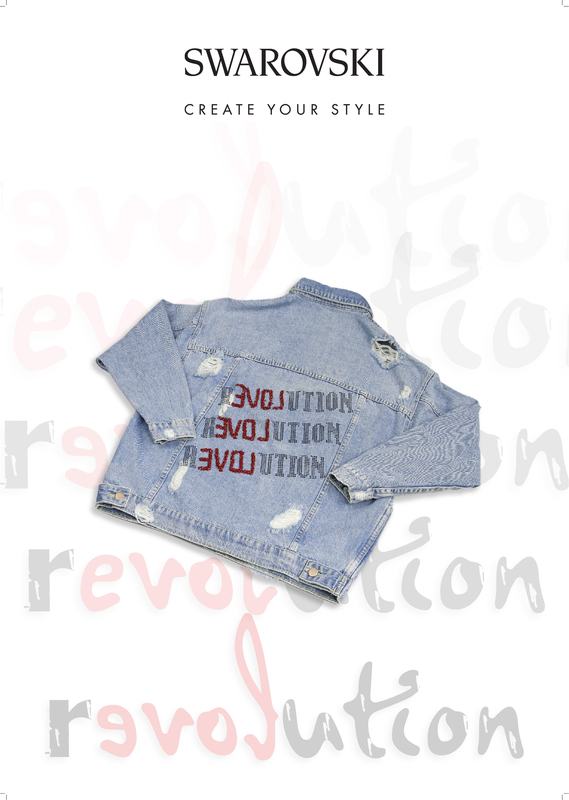 New step by step for this jacket linked right here. 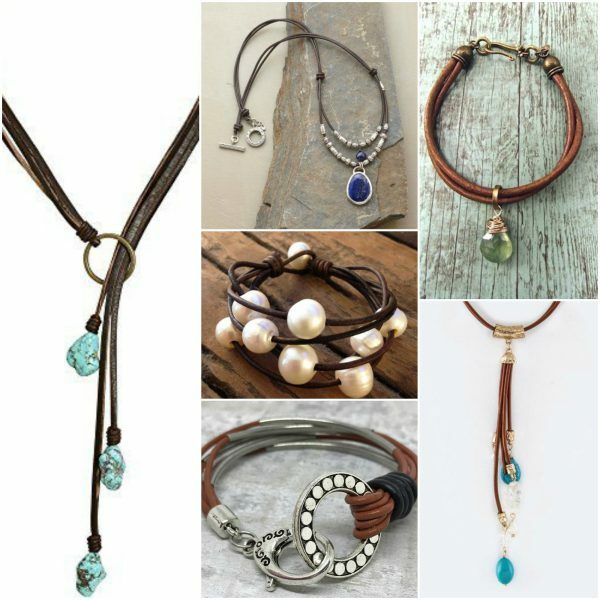 A quick search on Pinterest for leather cord jewelry will pull up hundreds of great images and inspiration for leather projects. 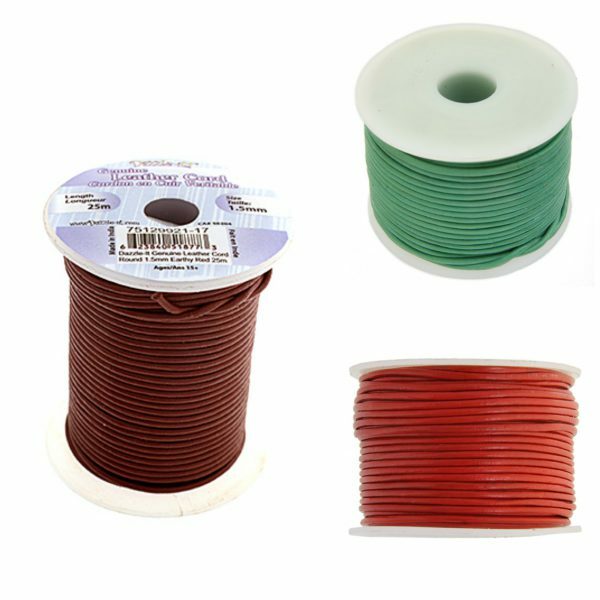 Our genuine leather cord is available in many wonderful colors. 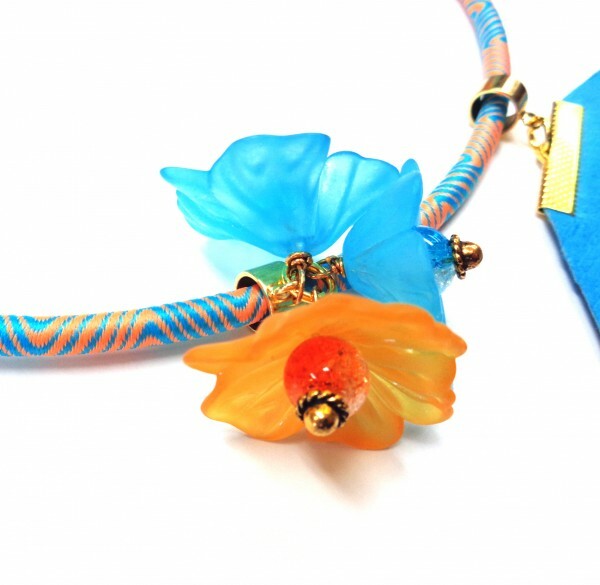 It is an ideal replacement for chain when designing necklaces and bracelets. 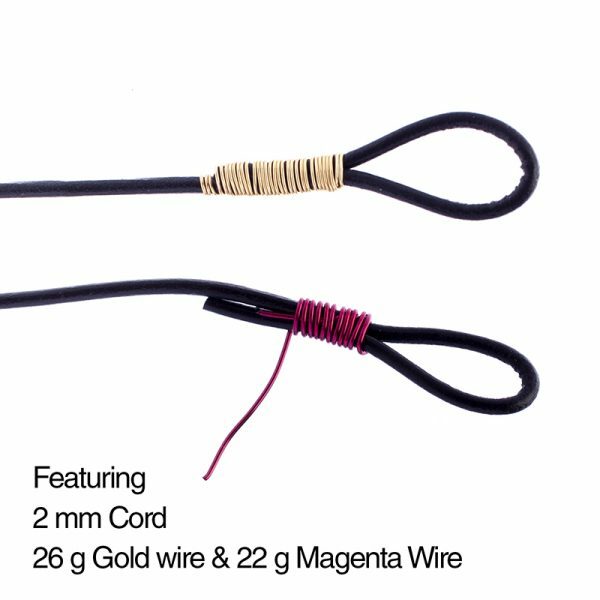 Leather cord can be tied together for fast no-clasp peices. 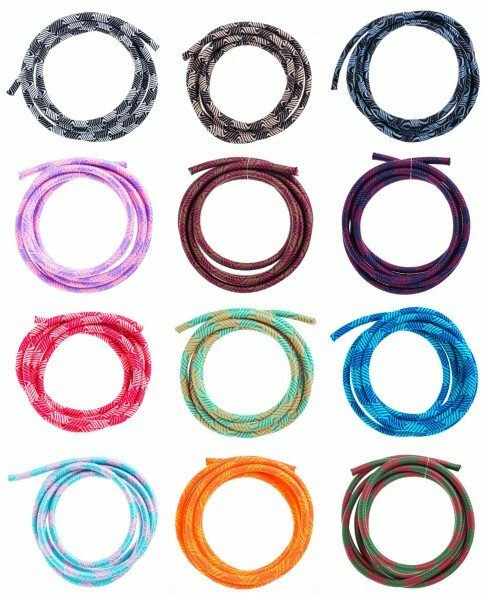 You can also use a number of unique products to finish the edge of the cord to make wearable jewelry quickly too! We have over a dozen options to share with you. 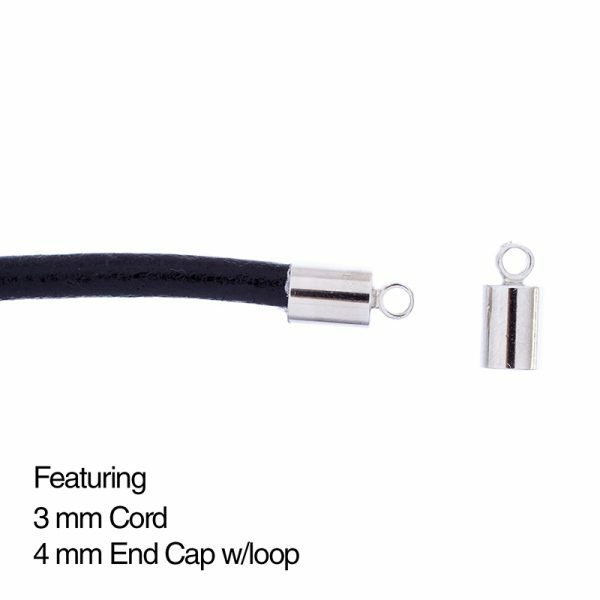 Bend your leather cord and wrap with wire to make loops that can go over buttons and other clasps. 2. 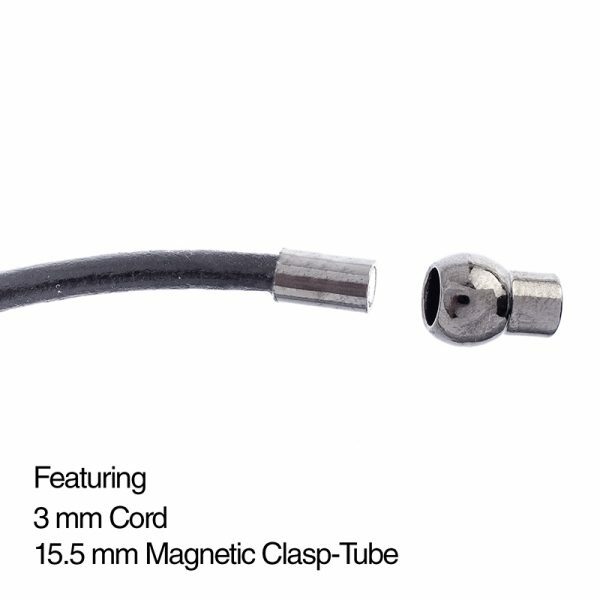 Use end caps that are attached by flattening the mid section with pliers. Finished jewelry looks high end and the end caps can be linked with jump rings to clasps, charms, tassels and more. 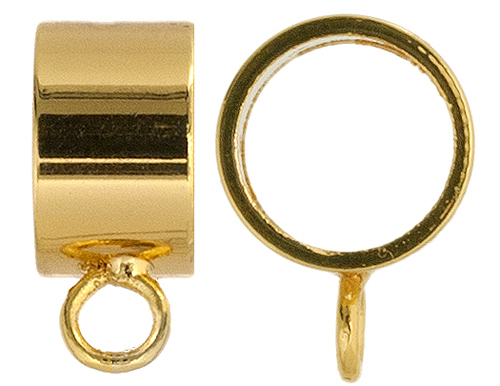 We have a small assortment of these end caps left in stock linked here. 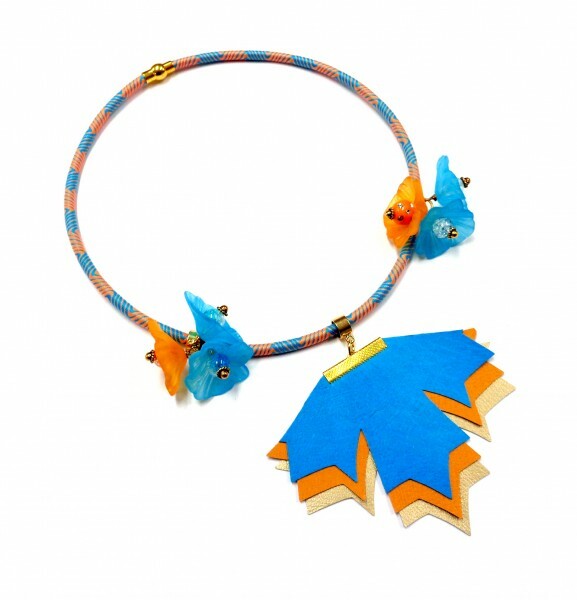 We also sell a revolving version of these that are beautiful and linked here. 3. These end caps “pinch” into place. A little dab of glue keeps it more secure. 4. 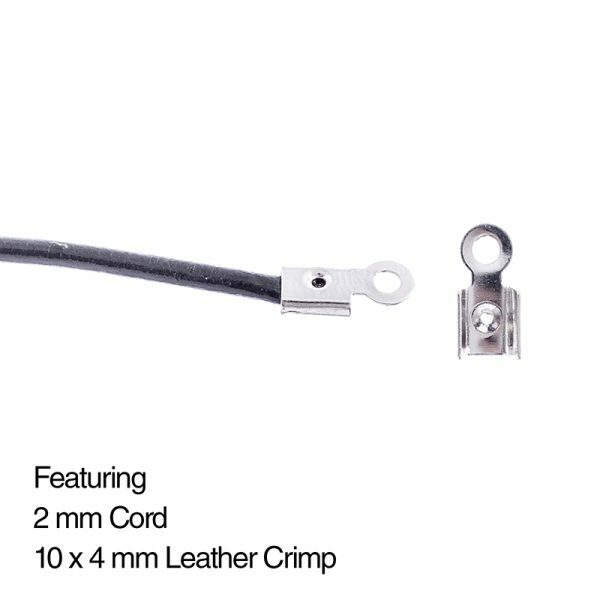 Leather crimps are the most common way to finish a cord. 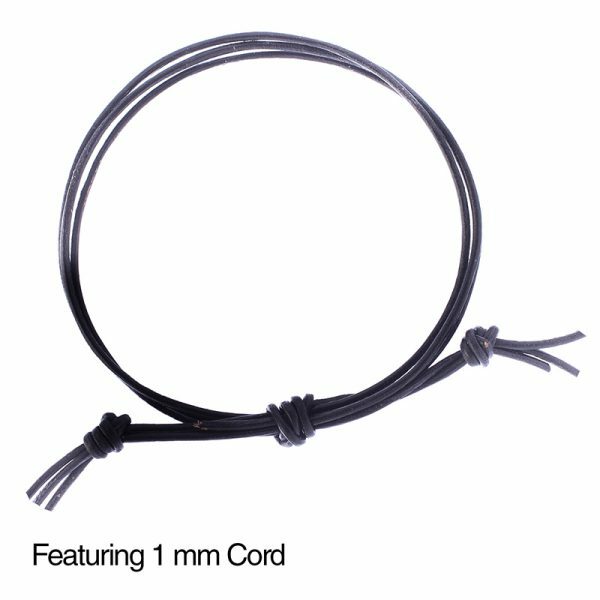 We have a wide assortment of sizes so that more than one cord can be crimped too! Linked here. 5. Traditional glue on end caps in small sizing for leather is also very popular. Many people glue several cords into one end. We have end caps for one cord and more here. 6. 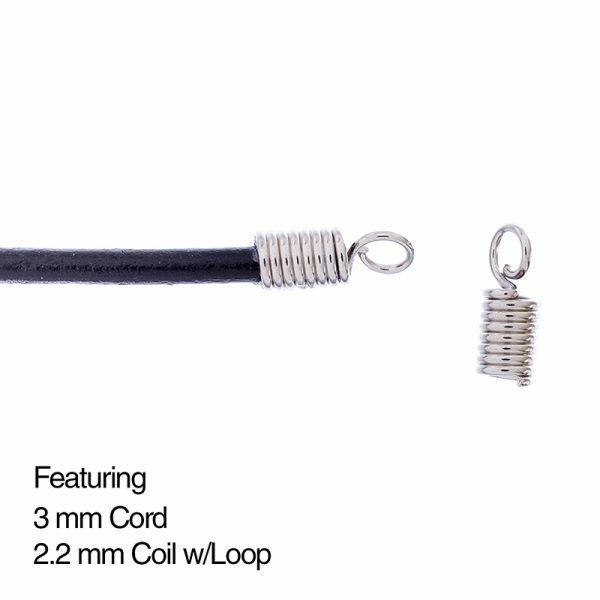 The coil loop is visible on lots of leather cord designs. 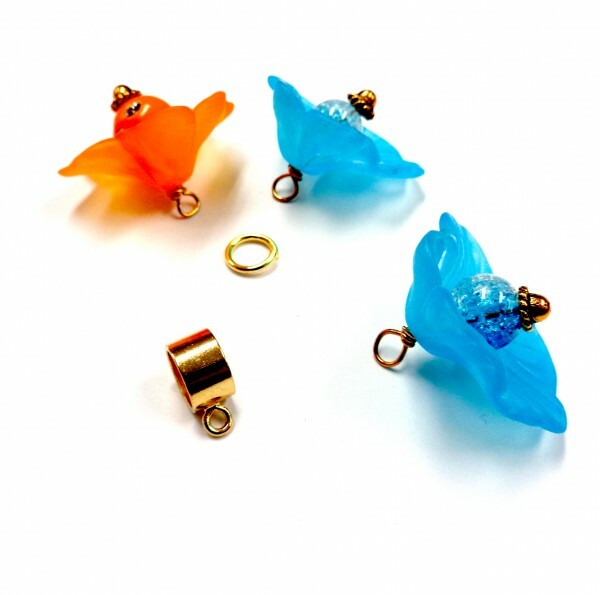 While you could make these yourself with wire, sometimes it is nice to have them finished and ready to attach with glue. Linked here. 7. 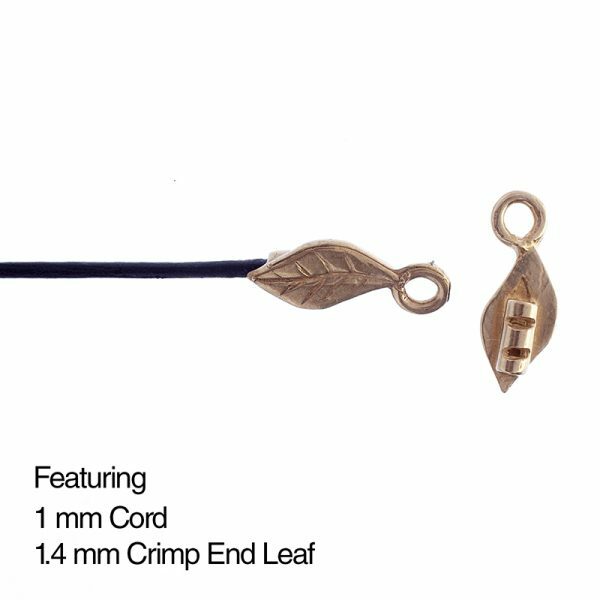 We have some decorative crimps that act in the same way #2 on this list works. These caps have a mid section that you flatten with pliers. 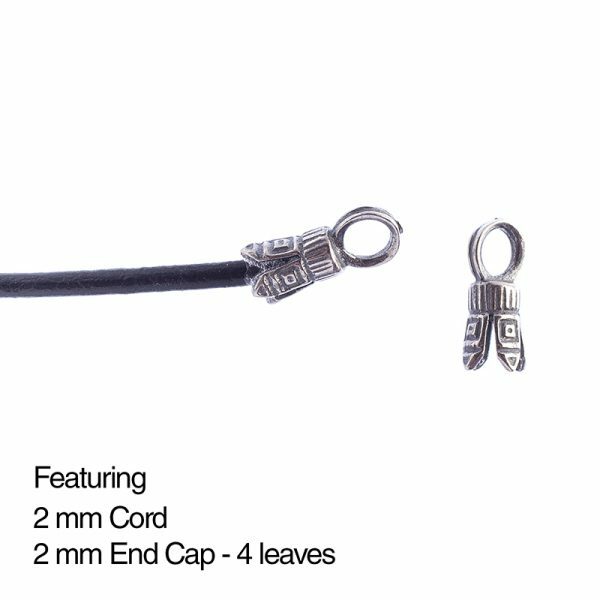 This grips and holds the leather cord in place. 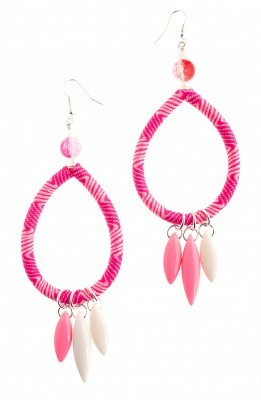 Their design are meant to be seen and featured. 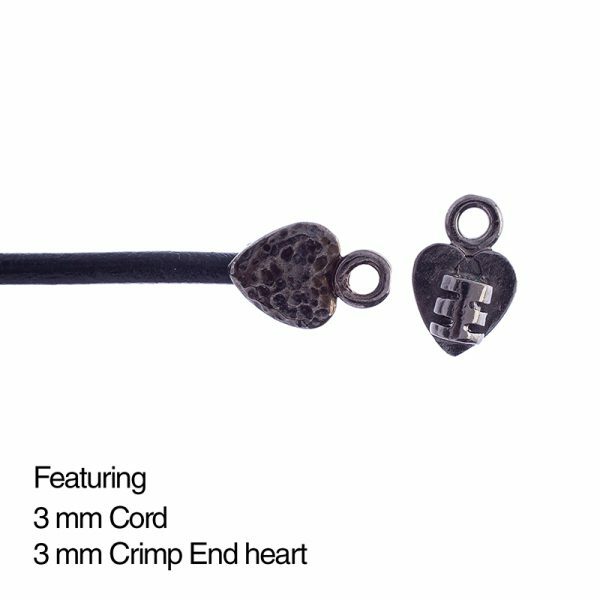 These crimp ends are also available in sterling silver. 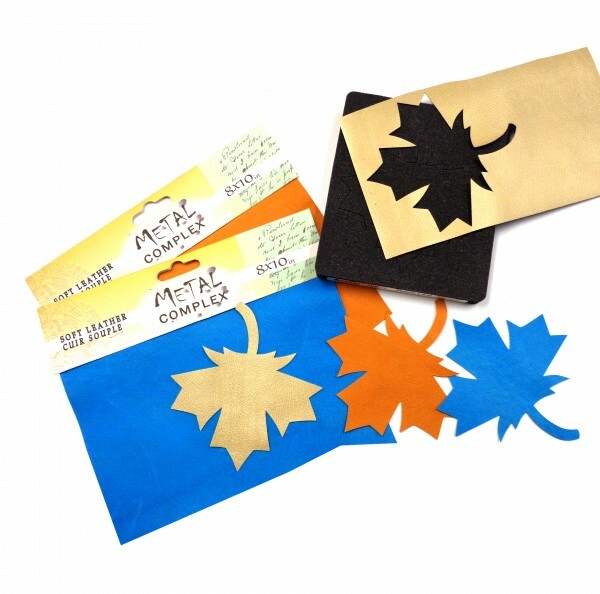 Leafs linked here. 8. 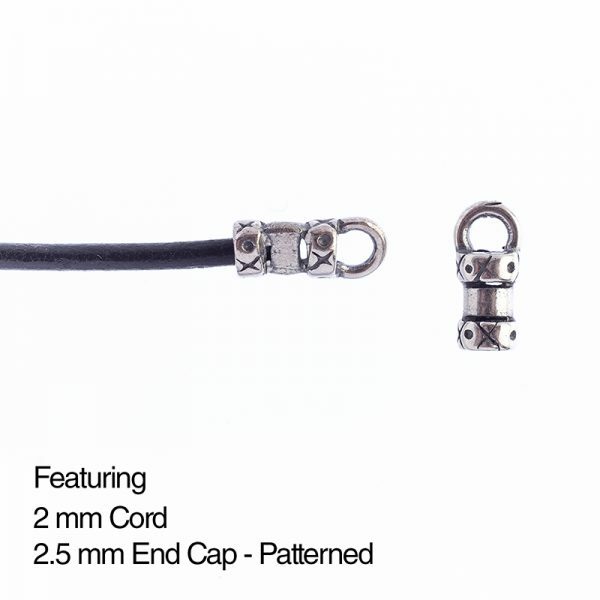 Glue-on magnetic clasps make your peice instantly wearable. 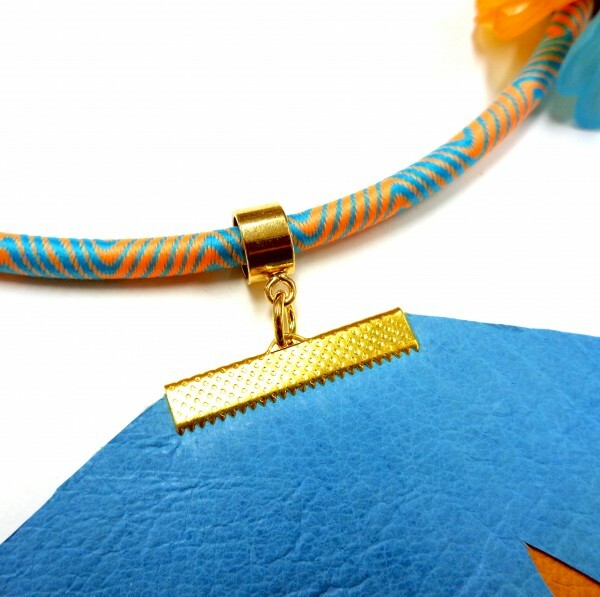 The ends are finished and the clasp is easy to open and close. 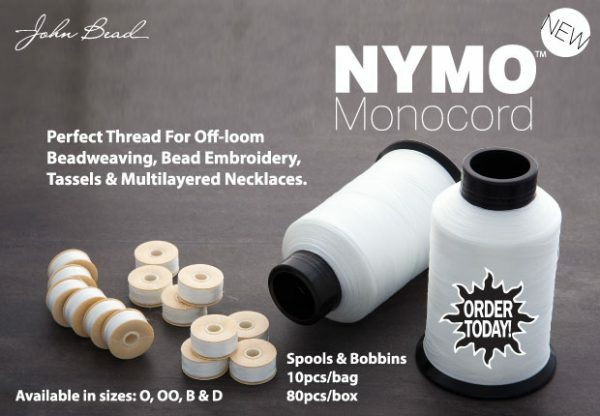 Our entire collection is linked here but you will need the caps you can glue-on. 9. 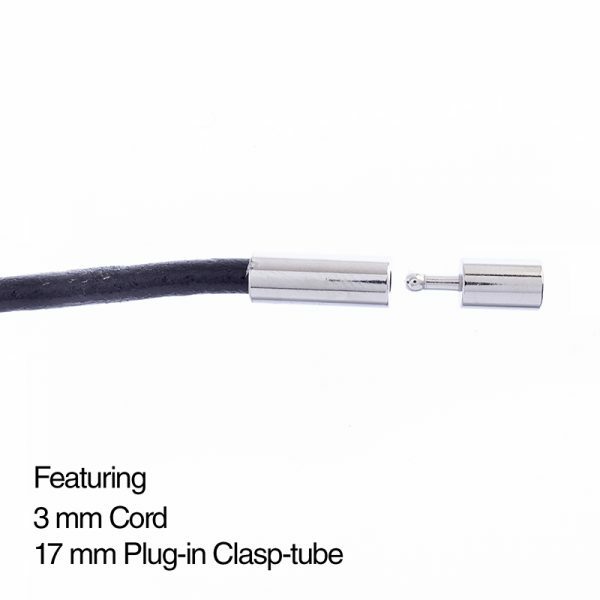 The plug-in clasp tube is also a great option for finishing a cord. The link is here. 10. 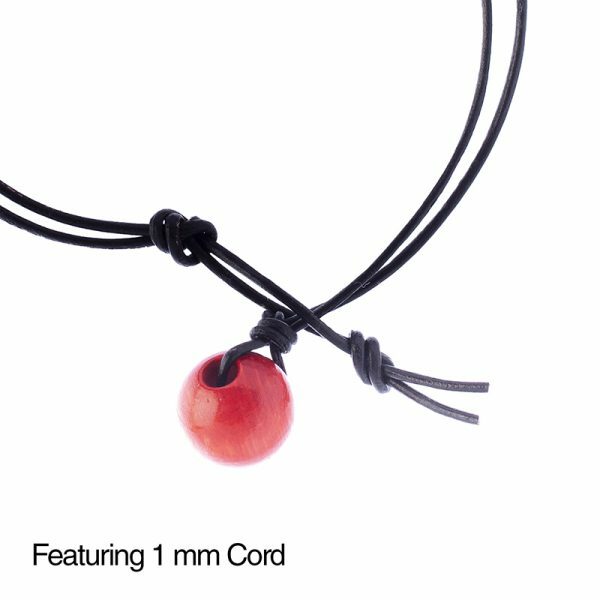 A knot is also acceptable for finished leather cord jewelry. No tools, no components! 11. 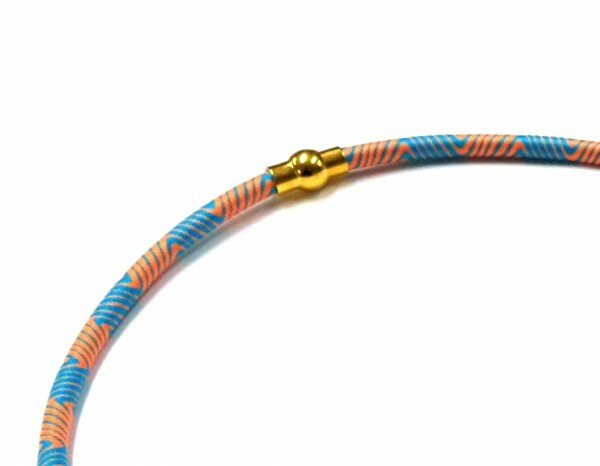 A bead plus a knot is even better for a finish. 12. 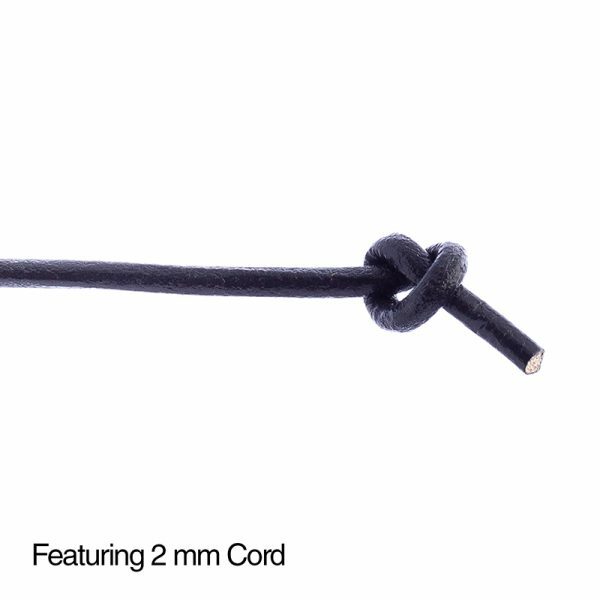 Of course, knotting more than one cord creates a fridge effective. 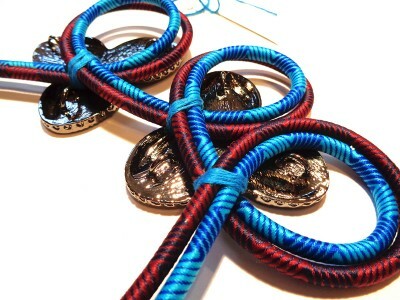 Also, take a moment to google “sliding knot” for one of the most common additions to leather cord jewelry. There is a video explaining the knot right here. 13. 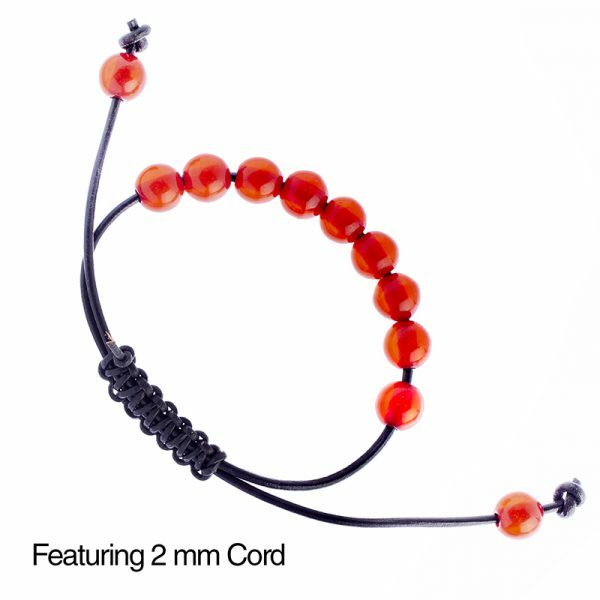 Leather cord plus a bead also creates a button style clasp. 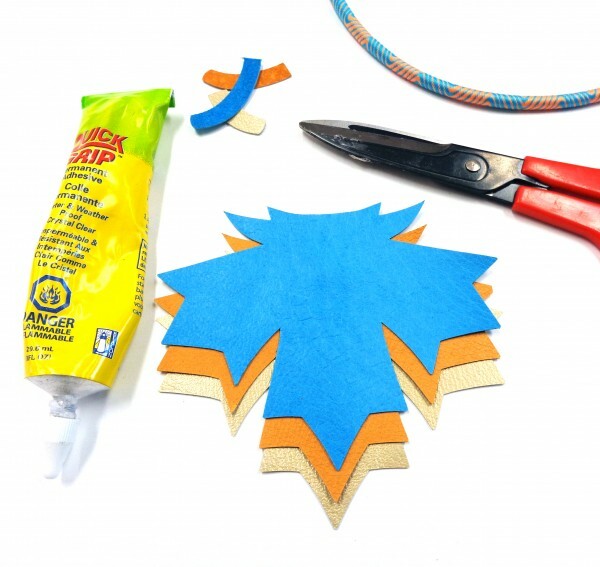 Easy and no tools required. 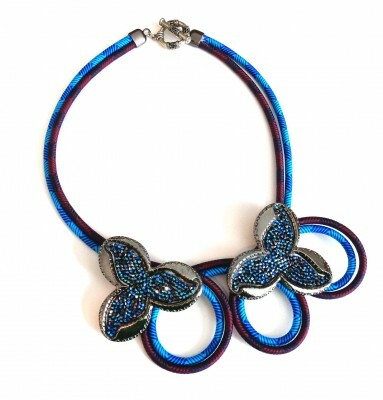 Instant Statement Necklace by Carmi Cimicata for John Bead. 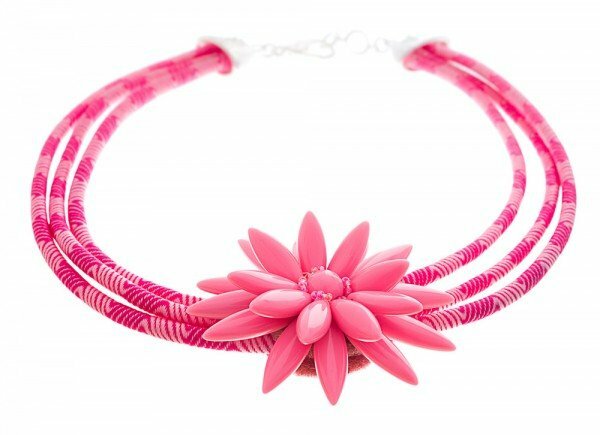 This necklace is easy to create if you enjoy simple twisting techniques and hand stitching. 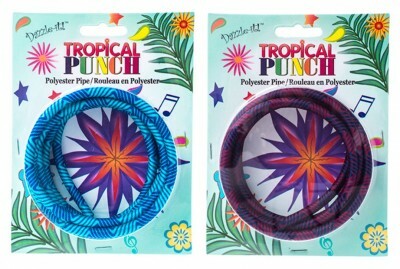 Polyester Pipe was one of the newest stringing materials to be introduced by John Bead as part of their Tropical Punch collection. 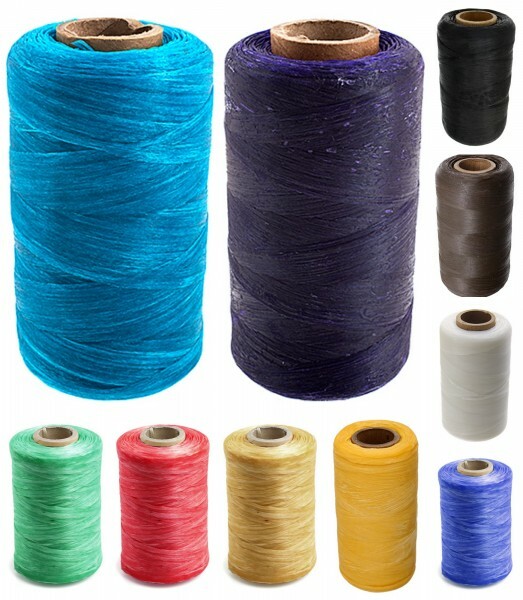 There are many color options to choose from. For this project I used Aqua/Royal Blue and Navy/Burgundy. 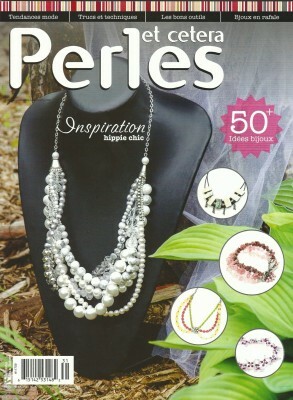 The fabulous crystal filled bezels you see featured are created with Instant Glam components. 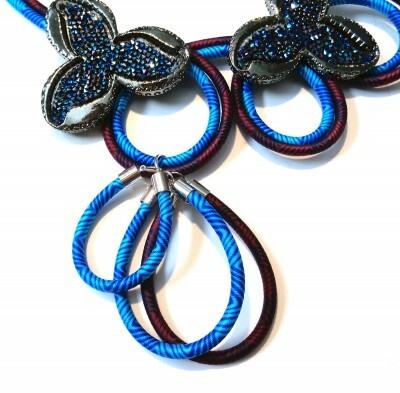 The Blue Crystal Rock applique paired beautifully with the blues in the polyester Pipe. In order to get my necklace shaped, I used masking tape to help me keep both polyester pipe strands side by side. Strategic hand stitching on the back side of my piece ensured that the curves would stay in place. 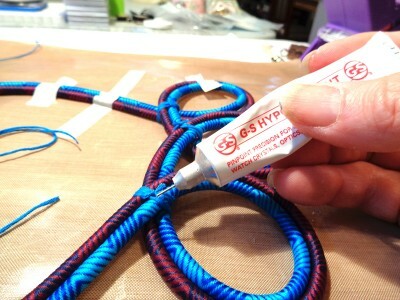 I even added a tiny bit of glue to my thread knot for extra security. 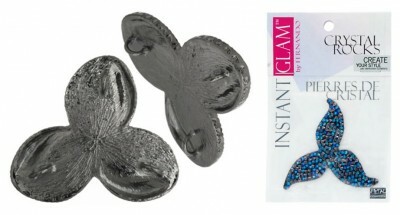 The Instant Glam bezels already have three soldered links on the back. 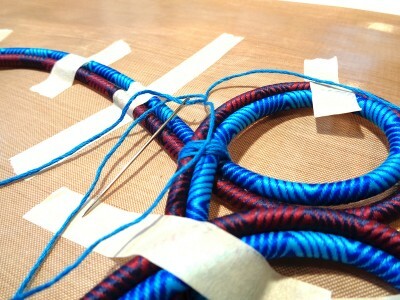 I used a needle and thread to join the bezels components to the polyester pipe using those links. I was almost done. I could not decide if a third bezel was needed. After showing my work in progress to our Creative Director; Fernando Dasilva it was pointed out that perhaps another loop was needed. So I added these three loops by simply gluing end caps to some of my leftover polyester pipe pieces and attached them with a jumpring. I think the bezels are now balanced and the asymmetrical look I was envisioning has been achieved. 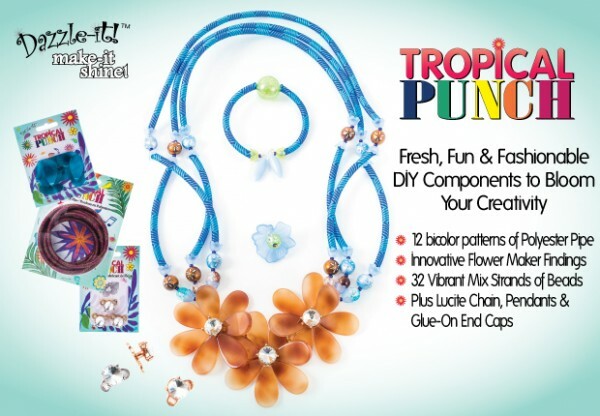 Tropical Punch is shipping now! 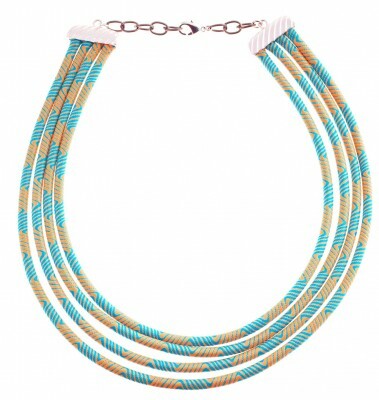 Metal Complex has two new colours in the sinew collection.